i‑effect® is able to fully automate workflows and the lifecycle for electronic data exchange, EDI and data conversion as well as data integration on IBM i and IBM Power Systems. Why are EDI automation and EDI workflow so important? Because this eliminates the need for manual activities when linking internal application process steps with overlapping operations. The design of business processes between the company and its external partners works faster and more error-free. In principle, EDI automation is already genetically based: IT systems "talk" to each other independently, without any further human intervention. The only question is how EDI automation is controlled and monitored. i‑effect® offers an intuitive user interface with WebControl, via which the user can assemble individual process steps of EDI processing into complex workflow processes at the click of a mouse. Structural and semantic errors in inbound EDI processing are analyzed and suitable escalation mechanisms are provided. The administrator can design the processes from data entry to transfer independently and according to individual company requirements. You want to get to know i‑effect® better? What types of automation are there? With i‑effect® any automatic processes (processing steps) are realized with the help of server tasks. There are two triggering moments for an automated workflow: event-controlled (monitor) or time-controlled (schedule). Also manually (single) sequences from i‑effect® or external programs can be started. The user can create workflows for the individual server tasks, which then trigger an action (depending on the result of the server task). If a task is running on ERROR, you can automatically receive an e-mail with a link to the relevant session. Each job or server task created with i‑effect® creates a unique session with a session number. Performed sessions are logged in the session logbook. In a session, the user finds all details of the session at transaction level (logbook). How can the overview be kept? In the i‑effect® Server subsystem of menten's EDI software, workflows can be set up that call any system commands (not only i‑effect® commands). Existing processes can also be automated. Each job or server task created with i‑effect® creates a unique session with a session number. Sessions are logged in the session logbook. 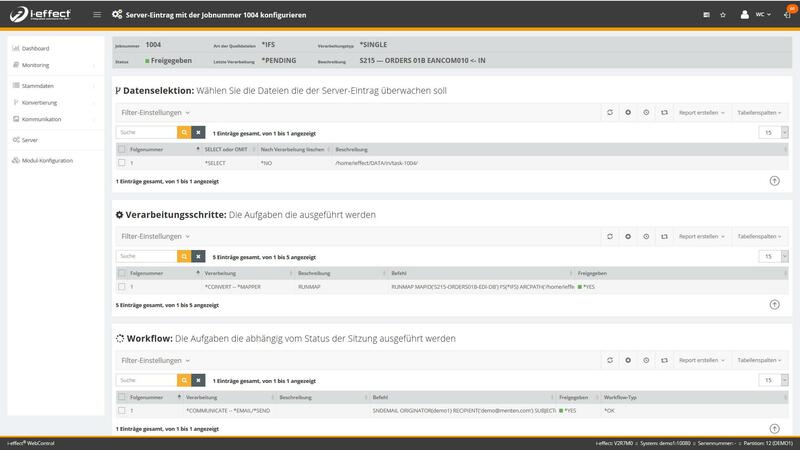 In one session the user finds all details of the session on transaction level (logbook).